Stay fit and save money on gas! Explore our extensive show room for your next bicycle. We can perform service and repair on any brand of bicycle. Bring it into our shop today for a diagnosis. Don's Bicycle Sales & Service provides locksmith services during store hours with keys made while you wait! Are you interested in saving some money in gas and burning some calories? A great way to stay fit and save money on your transportation costs is to invest in a bicycle! Bicycles have a small up-front cost and minimal on-going expenses, as opposed to the high cost of purchasing an automobile and the constant expenditures for gasoline fill-ups. When you are ready to purchase a new bicycle come see the experts at Don’s Bicycle Sales & Service. 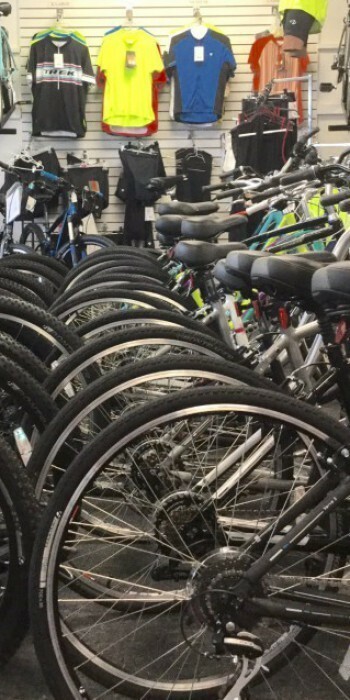 Our extensive show room offers a wide selection of bicycles, skateboards, and adult tricycles from top name brands to meet a variety of budgets. Don’s Bicycle Sales & Services has been servicing the residents of Wilson, North Carolina for 30 years. In addition to bicycles, accessories, and apparel for cycling we also carry equipment for skateboard enthusiasts. Not only are we able to handle everything bicycle related, from sales to repairs of any brand of bicycle, we also have a team of locksmiths that are always available and ready to come to the rescue when you are locked out of your home, business, or automobile! Keys are made while you wait!